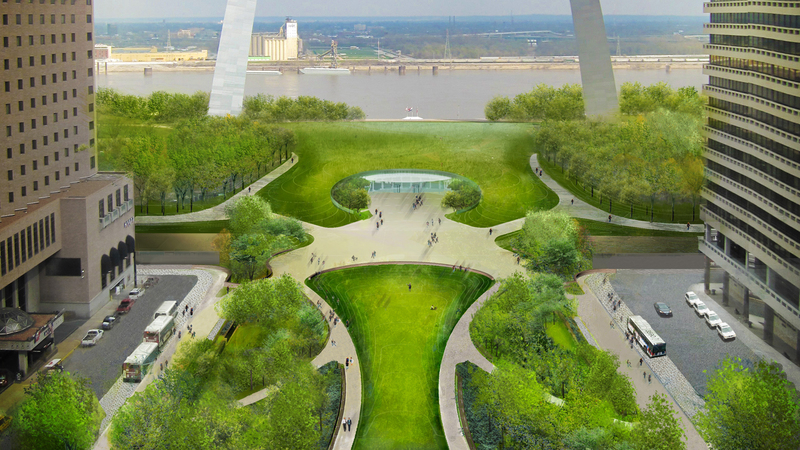 The connection centerpiece of St. Louis’ Gateway Arch Park Foundation’s initiative is the $15 million Park Over the Highway Project, which includes a 285-foot long “land” bridge that carries a landscaped pedestrian greenway over Interstate 44, making a seamless connection between downtown and the Arch grounds. 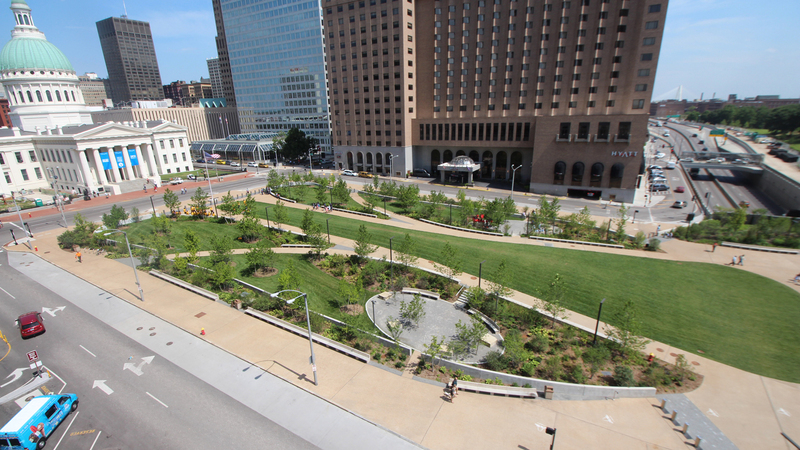 In addition to the land bridge, the Park Over the Highway project necessitated significant modifications to interstate ramp connections, other bridges, downtown roads and intersections, traffic signals and traffic flows, and reorganizing access into the downtown core. Specifically challenging was converting Walnut Street from a one-way that carried traffic into downtown to a two-way that carried traffic in and out of downtown; all while not impacting existing right-of-way, incorporating ADA compatibility and securing turning movements for the largest category of semi-trailer trucks. The design of the 100-foot x 285-foot land bridge was unique in both purpose and design. To honor the iconic arch, the bridge ends are curved to mimic its shape, with curved end walls ranging in height from eight to 14 feet. More than a purely functional bridge, the design would need to accommodate a variety of loading types. 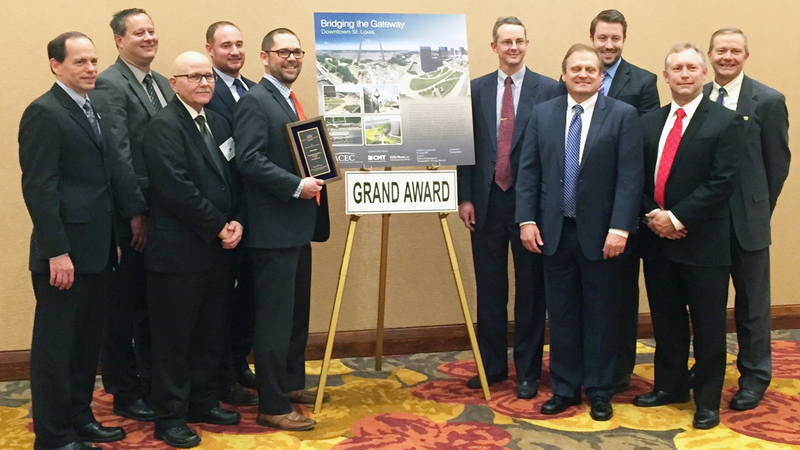 Designing an irregular shaped non-parallel girder bridge that also supports unique loadings for and eventual 30-foot-high landscaped tree canopy was an unprecedented achievement that required extensive collaboration in order to achieve MoDOT approval. 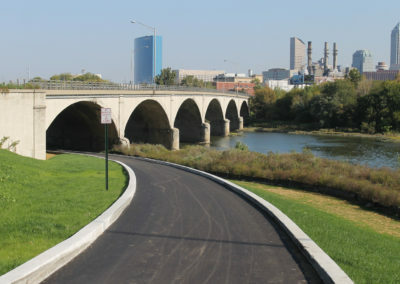 During design, the Pine Street bridge, originally slated for demolition, was repurposed for pedestrians and provided another access point to the arch grounds. A one-day Value Engineering workshop was facilitated by Crawford, Murphy & Tilly (CMT) targeted specifically to construction phasing and reducing impacts on traffic, the first known application of its kind. The result was a construction schedule that was shortened by more than three months and a cost savings of $800,000. 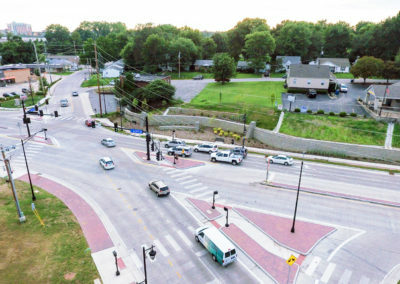 The project was completed under MoDOT’s program budget, with design coming in two months ahead of schedule and construction three months ahead of the target date. The project showcases how a successful engineer-led team can balance the creative vision of architects and planners with the practical and functional concerns of a transportation agency to deliver workable and optimal solutions. "Wall Street Journal" article, "The Best Architecture of 2018: Building for Complex Experiences"
"American Infrastructure" magazine, "Bridging the Gap Between Icon and Necessity"
CMT was great to work with. They understood the historical importance of the project in physically connecting the Gateway Arch to the city for the first time in its history. 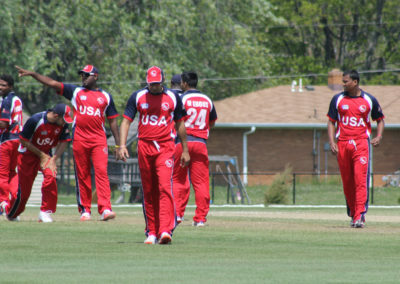 They were critical in making this project happen.